Professor Duncan: I’m asking you if you know the difference between right and wrong. Jeff Winger: I discovered at a very early age that if I talked long enough I could make anything right or wrong. So either I’m God, or truth is relative. And either case: booyah. That doesn’t really sound like the type of person who is ready to learn lessons or have people teach him things. And it’s true – throughout the seasons, Jeff begins to slowly learn that talking enough won’t always fix all of his problems. It won’t make Britta sleep with him, it won’t always cause the group to stop fighting, etc. Because, as difficult as it was for him to admit at the beginning, Greendale made him a better person. The study group made him a better person. And maybe it’s not even necessarily that these things MADE him better, as much as it is that they MADE him consciously identify aspects of himself that needed to be changed in order to become a better version of himself. 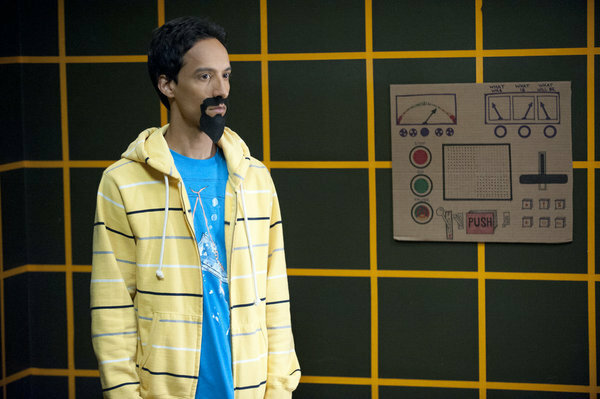 Hurting Abed’s feelings or making Annie cry or treating Troy like he wasn’t important helped Jeff realize that his actions have consequences. He can’t always be right and he can’t always make things right. We’ll talk about how his actions come full circle from the pilot to “Introduction to Finality,” but just keep these thoughts in the back of your mind for now, because we open the episode with something interesting. Just in case you were crying so hard at the end of the episode and couldn't remember exactly what the plot was about, here's a recap: As we know from the end of "The First Chang Dynasty," Troy sacrificed himself to the Air Conditioning Repair School Annex so that he could save Greendale and his friends. When we open this episode, it is nearing the end of the summer and Jeff is attempting to study with the group so that he can pass his Biology exam. Britta can't concentrate because she misses Troy, and Annie reveals that Abed hasn't even left the apartment since Troy moved out. The dean sidles up to their table and informs the group that Subway will no longer be in Greendale's cafeteria, which means that Shirley's sandwich shop will be in business. Well, if Shirley and Pierce can agree on whose name should be on the contract -- it was Shirley's idea for a shop, but Pierce's money and the two leave the lunch table at odds. There’s obviously the prevalent building of a Shirley and Pierce rivalry over the ownership of their sandwich shop, which comes to a head in this episode. In spite of the fact that the group has proven that they love one another, and in spite of the fact that Jeff has come to accept that he would do anything for these people, insecurities and anxieties and old habits creep in quite easily. The reason that he agrees to let Britta have a therapy session is because he is afraid that he is broken or crazy already and needs someone to fix him. But what I’ve noted before in these reviews in regards to Pierce and Jeff rings true with Abed as well – these characters’ fears of becoming the person they least want to be ironically CAUSE them to become that person. Abed’s fear of being crazy, of being chained to that metaphorical locker by himself cause him, inevitably, to attempt to prevent that and thus drive him to ACT crazy. Evil Abed attempts to convince Abed that when things get dark, the smart go bad. Abed seems to contemplate this and ends up following the Evil Abed into the Dreamatorium. On campus, Jeff has isolated himself in the library to study about mitosis (also, let’s take in the irony of the show – the study group is supposed to be just that: a STUDY group, and yet every time the seven of them attempt to learn something, they fail. At the beginning of the episode, Jeff is trying to learn what mitosis is, and at the end of it, he STILL doesn’t know what it is) when Shirley approaches, intent on asking for his help with Pierce. The elderly man overhears, however, and insists - as the dean approaches - that if Shirley tries to sign her name on the sandwich shop agreement, he'll sue her. Shirley then turns to Jeff for help, who initially declines (hilariously hiding himself behind his propped-open Biology book). I think that it does, however, speak to Jeff’s character that he decided to agree to help Shirley out with her case. He didn’t have to, and in fact it would have been easy for him to brush her aside completely. But the people in Jeff’s life have begun to impact him and his relationship with Shirley, especially, has taught him to be a more compassionate person. So Shirley and Pierce meet one another in summer court that day with Dean Pelton presiding as judge. Jeff represents Shirley, and then Pierce enters with his lawyer -- Alan. And then, quite suddenly, Jeff is faced with his past again in the courtroom in the form of Alan. Since “Accounting for Lawyers,” we really haven’t encountered his past and it’s a very important part of him. This was his goal, from the beginning – to replace his Bachelor’s in four years and return to his life as a lawyer. And initially, Jeff would do anything to achieve that goal and bring it to fruition. He had no problem with lying or cheating his way through. He cared about no one’s well-being apart from his own. But post-“Accounting for Lawyers,” Jeff came to the realization that he was no longer the same person who got disbarred. He had changed, subtly – Greendale had changed him, had caused him to want to become a better person. He didn’t need to hold onto his old ways anymore, and taking an objective step back and looking at Alan with the realization that HE is the man who got him disbarred in the first place… it humbled Jeff, I think. It also hurt him to know that he COULD have easily become just like Alan: guiltless and smarmy. But he’s not. Meanwhile, in the Air Conditioning Repair Annex, Troy learns from Vice Dean Laybourne that he is basically the messiah of the annex. Shortly after learning this information, the Vice Dean dies in a freak air conditioning-related accident. The newly appointed Vice Dean of the school -- let's just call him Manny again, shall we? -- releases Troy from his duties and back to his friends. Troy seems bewildered by this abrupt dismissal and walks out of the room. The differences between Troy and Jeff’s characters are even more evident too in the finale. As we saw in “The First Chang Dynasty,” the athlete was willing to sacrifice everything for the sake of his friends, even though it hurt him. The new Vice Dean (we’ll still call him Manny) releases Troy from his commitment to the Air Conditioning Repair School Annex. And someone like Jeff would take that escape willingly. He would eagerly return to his friends. But Troy is different and has a deeper sense of commitment to things than Jeff often does. Even things that others assume are trivial or silly, Troy counts them as important if they are made with a promise. That’s something of significance, I think. And Troy values honor as well, and is willing to go to great lengths to fight for this honor. Back in summer court, Alan is examining Annie, attempting to get her to badmouth Shirley's character. There’s a moment that’s quick and insignificant right after Alan examines Annie on the stand – it’s a moment where Shirley, distraught over how she will likely lose her case, shakes her head and whimpers. And Jeff, without pressing, squeezes her arm reassuringly. This is interesting to me (and also sweet) because at the beginning of the episode, Jeff treated the study group like a nuisance. And really, that’s kind of his fallback: he treats the group like a problem. We saw this evidenced clearly in “Early 21st Century Romanticism.” At the end of that episode, he realized that he needed the group – that they weren’t an issue, but his friends. And this little moment between him and Shirley demonstrates how much he’s willing to do for his friends now, and how much he wants to protect them from people – and interestingly from the person he used to be. Because remember, this was exactly what Britta did in the pilot episode: her role as self-appointed leader of the group was to protect everyone else from Jeff, who was only out for himself and who had no problems dividing them. Now, as the leader of the group, Jeff’s goal is to protect everyone from the type of person he used to be. Full circle. At La Casa de Trobed, Britta arrives to meet with Abed for their therapy session. Instead of him, however, she encounters Evil Abed. There’s an interesting confrontation in the Dreamatorium with Evil Abed and Britta, and it makes me curious as to why, exactly, Britta did decide to choose psychology as her profession. If “Evil Abed” is to be believed, then it’s because she wants to diagnose the world around her in order to make herself feel more special. And, to be honest, I had never really considered this possibility before – the notion that Britta is average and her insecurity with being average is what drives her to “therapize” other people. Because if she can make someone normal or have issues, it makes HER less average and something more spectacular. That’s something to ponder. Evil Abed leaves the Dreamatorium and insists that - since this is the darkest timeline - he is going to find their timeline's "lame hero" Jeff Winger and cut off his arm (so that they really will enter into the darkest timeline). When Alan confronts Jeff and insists that he throw the case in order to return to his former life, there’s this definite sense of coming full circle from the person Jeff was three years ago. Back then, his only goal was to get out of Greendale and return to normal. And he wanted to do so as unscathed as possible (his conversations with Duncan reflect that). But now, Jeff is presented once again with a choice – he can throw the case that his friend is fighting for and go back to the life he wanted after Greendale or… he can choose not to do that. But make sure you realize that Jeff DOES have a choice, and what he chooses during this episode defines him more than any other choice he has made thus far. Shirley’s response does too, in fact. She must overhear the conversation between Alan and Jeff (or otherwise Jeff tells her), because she tells him to drop her case -- she doesn't want Jeff running into trouble when he returns to his old firm. And, she says, "I want you to have what you want." And this is perhaps the most poignant moment that we will encounter in this episode. Shirley (and the rest of the study group, really) love Jeff and they want him to be happy. They know that he plans to go back to being a lawyer when he graduates, and they want to see him succeed. Shirley sacrifices taking credit for her sandwich shop so that Jeff can have what he wants in life. And @elspunko said it so well in her notes that I can’t help but heartily agree and just quote her: “That’s his realization that, yes, I CAN put these people before myself and before what I want, because no matter where I am in ten years, these will be the people that love and support me and if I have them in my life, everything will be okay. I can be a good person because they’ve allowed me to be a bad person, and they’re still here.”And really, this is the moment that everything kind of hits Jeff – why they saved Greendale, why he is friends with these people, what they REALLY mean to him because of what they are willing to do. And it’s this realization that hits Evil Abed and “turns” him back into normal Abed again: the notion that friendship and self-sacrifice (what Troy did for Abed and every other group member and what Shirley was willing to do for Jeff and what Jeff did for the group) make even the darkest of situations light. Because there is hope and goodness and love. In the Air Conditioning Repair School Annex, Troy has decided that something isn't right. He returns to the school (even though he was released) and confronts the new Vice Dean who, he learns, is about to be crowned. Troy challenges him in the sun room -- both men will be locked in a box with an air conditioning unit that they must repair. As John aptly clarified in his comment "each AC unit is venting into the other half of the chamber. Yes, the passage of time and the fact that Manny was exerting himself contributed to his collapse, but neither would have mattered if Troy's AC wasn't blasting hot air into the sealed chamber." And thus, our dear friend Manny begins to sweat and falter. Your Honor, I have no closing statement because I’m throwing the case. No, no. It’s okay. It’s fine, don’t worry. * My client, Shirley Bennett, my friend of three years, told me that it was okay. She said that what I want is more important. She’s right, right? I mean, guys like me, we’ll tell you there’s no right or wrong, there’s no real truths. And as long as we all believe that, guys like me can never lose. Because the truth is, I’m lying when I say there is no truth. The truth is, the pathetically, stupidly, inconveniently obvious truth is, helping only ourselves is bad, and helping each other is good. Now, I just wanted to get out of here, pass biology, and be a lawyer again instead of helping Shirley. That was bad. And my former colleague wanted so badly to keep his rich client that he just asked me to roll over in exchange for my old job. So I guess we all walked in here pretty bad, but now Shirley’s gone good. Shirley’s helping me. It’s that easy. You just stop thinking about what’s good for you and start thinking about what’s good for someone else, and you can change the whole game with one move. Now, if you like this idea, you can make it true by doing something good for everyone here. Throw this case out of court. It’s dumb. That is all. * Annie gasps and Jeff addresses her. Pierce, upon hearing these words, drops his case and chastises Alan for not making an inspirational speech like Jeff's. Shirley and Pierce both agree that Jeff's name should be on the agreement -- he will act as their attorney. Meanwhile, the new Vice Dean is losing terribly to Troy, who just stands there. Angered, the man blurts out that he killed Vice Dean Laybourne. With this knowledge (and upon seeing Laybourne's ghost), Troy decides that he could never be the type of person to enact vengeance on someone else -- he ends up saving the new Vice Dean so that he can be thrown into jail. After the summer court trial, Britta approaches Abed (who is no longer evil). I think it’s significant that Britta is willing to change her major again because of how much Abed’s words affected her – and you can tell that she’s dismayed because she thought she had finally found something that she was good at. But the sheer irony of Britta Perry continues to display itself in this episode – she set out to try and help Abed and seemingly failed. And yet, in failing, she managed to help Abed more than she realized. And then, the end montage of the episode seemingly wraps up some loose ends for these characters – Shirley and Pierce debut their sandwich shop, Jeff passes his Biology exam, Chang spies on City College’s dean (who still seems intent on running Greendale into the ground), we learn that Starburns faked his own death, Jeff chooses to start searching for his father (an arc that shows a lot of maturity on his part), Troy moves back into the apartment and into the old Dreamatorium, Abed takes a cardboard version of the Dreamatorium into the blanket fort, and finally the hashtag #sixseasonsandamovie displays reminding all of us that while some stories are ending, a lot more are just beginning. - Annie's outfit in the episode is very cute. - There aren’t many Jeff/Annie glances in this episode but here’s one! The callbacks to the pilot were amazing. I'm so happy that others pointed them out. @ashley_actually tweeted this: "The first song heard in the pilot was the last song heard at the end of Leonard's video." And near the end Pierce says, "So Jeff, are we still best friends?" That reminds me of 'Spanish 101'. The last two weeks have been an emotional rollercoaster, it's crazy. Thank you SO MUCH for these awesome reviews and many awesome tweets! Despite Dan being fired I do feel that his efforts have resulted in a real community. That speaks to his genius. I'm very happy the show has been renewed and I fully support the cast and crew. I'm hoping for the best. I will be here during the summer rewatches and of course for next season. Thanks again! I just HAD to throw in a bit of "Webster's Dictionary defines" for some nice irony. ;) And I never did really notice those parallels until I saw the tumblr post, but it just goes how to show that this sitcom is brilliant. I am so thankful for everyone who has enjoyed these! Awww, we are most definitely all a community, and it couldn't be better! Nice analysis. If I may clarify one point though, the deal with the sun chamber isn't that it gets hotter "the more time that elapses and the more movement they make." It's that each AC unit is venting into the other half of the chamber. Yes, the passage of time and the fact that Manny was exerting himself contributed to his collapse, but neither would have mattered if Troy's AC wasn't blasting hot air into the sealed chamber. Thanks for the clarification, John! :D I hadn't quite understood that bit, haha. Oh my beautiful beautiful Jeffrey Winger. You don't even know how far you've come, do you? I didn't even fully grasp all the parallels to the pilot till that full circle graphic was posted. Our beautiful little show. I just want to hug it. What a season. I discovered your blog circa RCT. And I remember thinking...ooh this girl is good. And then we became pals, and your wit and your humor and your insight and general awesomeness truly astounds me. You have a gift with words, Jenn. Keep pursuing it. I look forward to rewatches. Trying to figure out what to do being a SYTYCD fan. Perhaps I will rewatch and then watch the show on the DVR and fast forward thru commercials. (Aaaaaand I am the reason advertisers hate DVRs). Either way, I look forward to your blog every week. Ugh. It gives me all kinds of ~FEELINGS~ to see how far Jeff has come and what an adorable and wonderful and amazing guy he is (you know, hang-ups and all).